Beware of scam browser popups, similar to those pictured, which inform you that your computer has been infected with a virus and invite you to call a free-phone number to have it removed. The popup alerts attempt to mimic genuine messages like the ones produced by real anti-virus software, or by Windows. 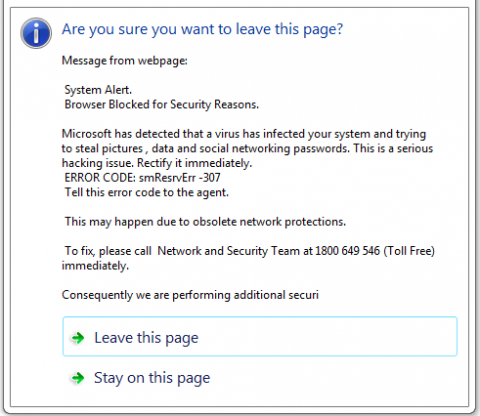 The alerts claim that your computer is infected with a virus that cannot be detected by ordinary anti-virus software, but you can call a free-phone number to speak to a technician who will be able to remotely remove the virus for you. These popups are scams - do not call the number and do not click any 'OK' or other buttons that may be on the popups. Clicking the buttons will very likely download more malware onto your machine and could allow a scammer to take control of your computer and steal your data. The popups are themselves caused by malware on your machine. The most likely way they will occur is if you have downloaded and opened an attached document or zip file from an email scam. They may also be automatically downloaded if you have visited a website which has been hacked. The most common of these scam popups (so far) says "Chrome Browser has detected a new virus. WARNING! 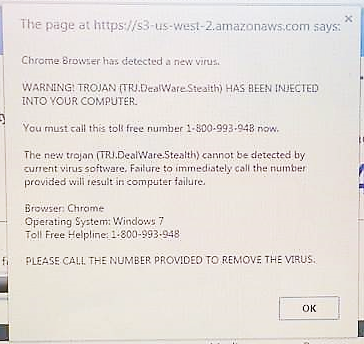 TROJAN (TRJ.DealWare.Stealth) HAS BEEN INJECTED INTO YOUR COMPUTER". Another version aims to look like a Microsoft Windows security message, and starts "Message from webpage System alert Browser blocked for security reasons. Microsoft has detected that a virus has infected your system and trying to steal (sic) pictures, data and social networking passwords. This is a serious hacking issue. Rectify it immediately." If you see one of these popups, close your browser immediately, disconnect your computer from the internet and run a full scan of your system with your installed anti-virus software. In most cases, this will identify and remove the threat. You shoudl always ensure that you have anti-virus software installed and that you keep it up to date. This scam was reported by Stay Smart Online, part of the Australian Government's Department of Communication and the Arts. The phone numbers in the pictured popups are Australian toll-free numbers. Never open attachments or click on links in emails unless you can verify the sender and you trust them. Never rely on the contact details provided in a pop-up message. Instead, find your anti-virus vendor's contact details through their official website.